Tucked away on a winding country road in Old Mystic, Connecticut, is the only remaining steam-powered cider mill in the United States--B.F. Clyde's Cider Mill. The Clyde family has been making cider here since 1881, and the sixth generation of the family continues to produce cider at this National Historic Landmark that is truly an engineering marvel. B.F. Clyde's is the oldest continuous producer of hard cider in America, too! After a peek inside at the workings of the old mill, where apples are pressed into tasty beverages, we followed the signs pointing to the mill's basement, where hard cider is sold in plastic jugs by the gallon and half-gallon. Bring a cooler if you're a long way from home! Of course, we couldn't resist the temptation to purchase the 28-proof "Black Out" cider. Other "potencies" and hard cider blends are available, as well. It's best to wait to sample the hard stuff until after you've arrived home or at your accommodations for the evening. But the good news is that you do want to immediately head inside the shop, where you can purchase a cup of some of the sweetest, tastiest non-alcoholic cider you've ever consumed to wash down fresh-baked, tender, delicious apple cider doughnuts. The shop is stocked with not only the Cider Mill's own products--cider, hard cider, apple wines, apple butter, apple pies, candy apples and kettle corn, but with other local and regional products and produce--honey, maple syrup, fudge, pumpkins, gourds, Indian corn, cheeses, mustards and more. B.F. Clyde's Cider Mill is just a stone's throw from Foxwoods Resort Casino and makes for a great stop on your way to or from the gambling action. Of course, don't lose so much money that you're tempted to drown your sorrows with cider! The Cider Mill is also close to other Mystic, Connecticut-area attractions including Mystic Seaport, the Mystic Aquarium and Olde Mistick Village. It's an easy day trip from NYC, Boston and other New England locations, too. When to go: B.F. Clyde's Cider Mill is open seven days a week from September through late December. 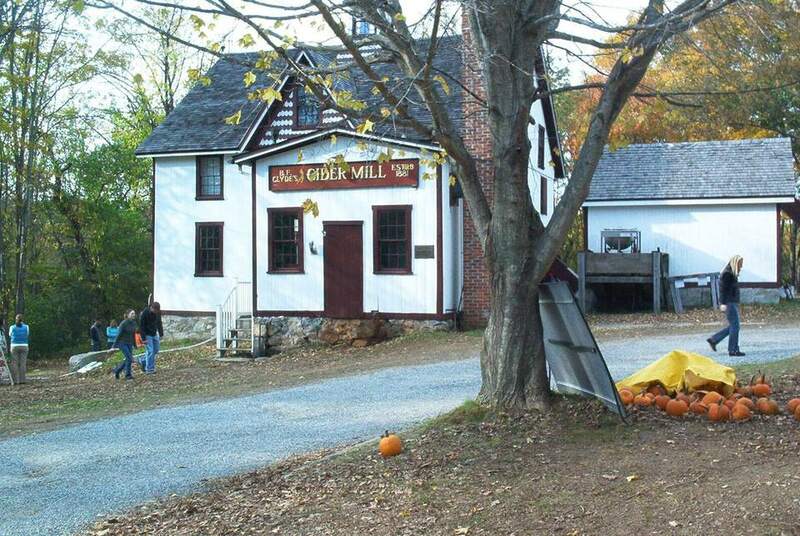 Weekends in October and November are the best time to visit if you'd like to be sure to see the antique cider mill in action. Special demonstrations take place on Saturdays and Sundays in October at 11 a.m., 1 p.m. and 3 p.m. and on Saturdays and Sundays in November at 11 a.m. and 1 p.m. (weather permitting). Call ahead for specific hours of operation: 860-536-3354. Getting to the Cider Mill: B.F. Clyde's Cider Mill is located in Mystic, Connecticut, just minutes from Interstate 95 at exit 90. From exit 90, follow Route 27 North toward Old Mystic. From Route 27, you'll follow the right fork in the road onto Main Street, then turn right onto North Stonington Road at the big rock in the road. B.F. Clyde's Cider Mill is on your left at 129 North Stonington Road, Old Mystic. Need help? There is a Tourist Information Center just off exit 90 in Olde Mistick Village at 27 Coogan Boulevard: It's a great place to pop in to pick up an area map, and the woman on duty at the information desk was most helpful in giving us very specific directions to the Cider Mill. Make the Most of Your Cider: With my "how to" on making your own hot mulled cider, my collection of other cider drink recipes and the dozens of recipes I've compiled for cooking with fresh New England cider.